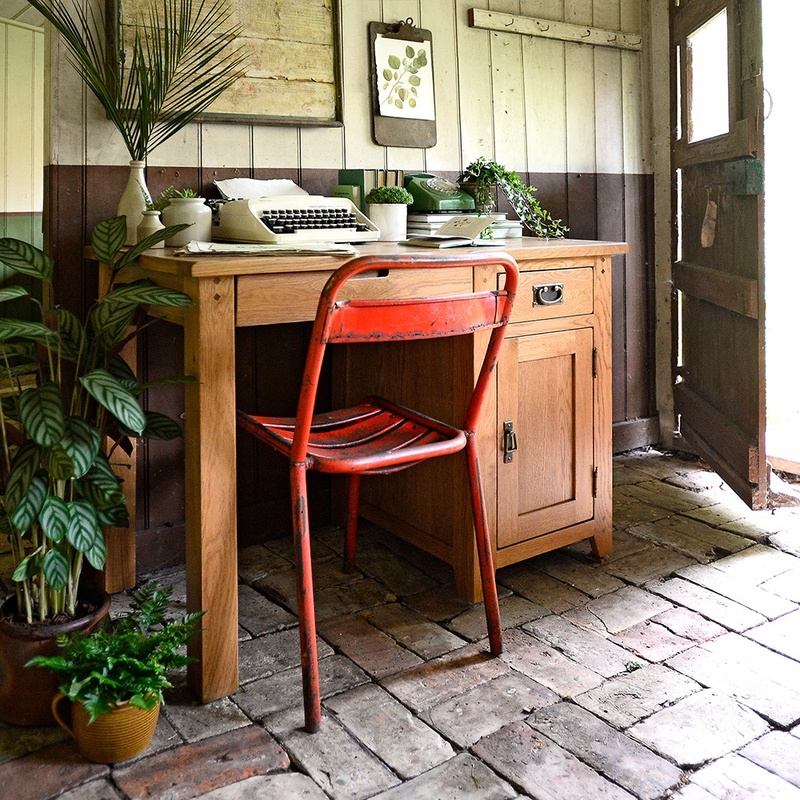 Country interiors are constantly evolving. Their classic core allows them to reinvent themselves gracefully as interior phases come and go. There’s a new kind of country style that’s capturing people’s imaginations. It’s aspirational but also wonderfully attainable and it’s all about striking the balance between old and new, soft and hard, modern and rustic. We explore some great ways to have fun with new country style and introduce it to your home. Combining multiple rustic textures in a concise palette of muted colours is a great way to achieve a fresh, modern country look. The smooth white texture of our Burford Grand Bookcase is complemented by a wash of white reclaimed boards, an untreated concrete floor and a classic White Lloyd Loom Chair draped in our knitted Darwin Throw. This understated combination delivers a super chic modern country interior. This classicly rustic sideboard is transformed into something fresh and forward thinking with a few strategically placed structural plants, palms and a cluster of dried alliums. Adding accessories like our Oriel Lamp is the perfect way to complement this contemporary look and illuminate your plant display in the evening. If there’s anything we’ve learned about the country interiors we love is that the faults and imperfection are what give it beauty and character in abundance. Modern country interiors aren’t about hiding the dents and scratches that have been worn in over time, it’s all about embracing those details and showcasing them where possible. Using new furniture and fixtures around the rustic areas help to frame and elevate them into a fabulous focal point in the room. Introducing some fabric or soft furnishings to an area with hard stone floors is a great technique for softening the look of your living space. 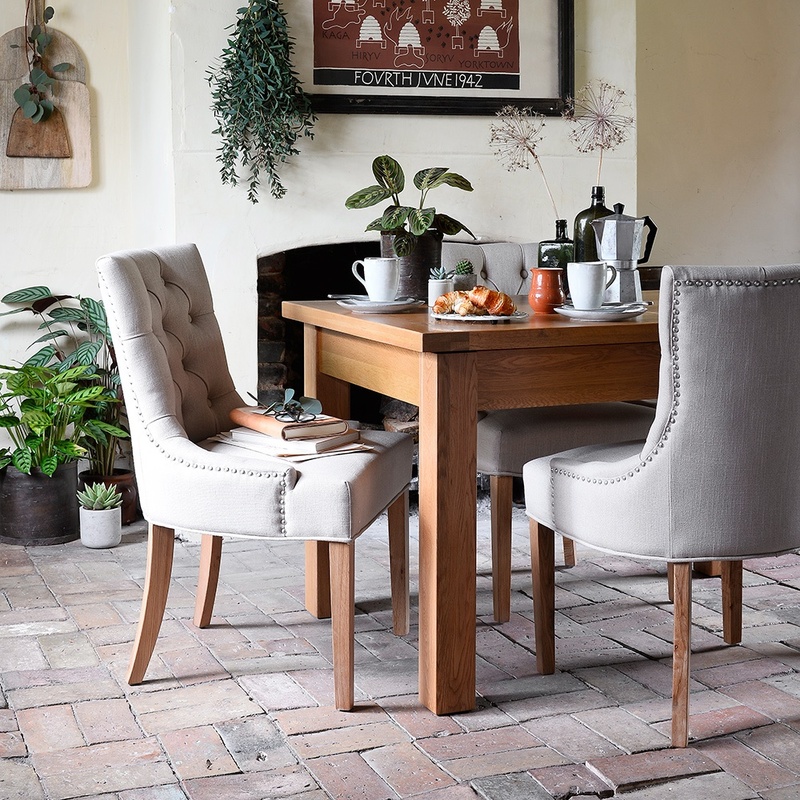 The textured cotton and plump, luxurious nature of the buttoned backs strikes the perfect balance with the rustic, hardwearing floor beneath. The silky smooth exterior of this rich grey coffee table offers a seamless sheen of perfection in contrast with the beautifully worn surfaces that surround it. 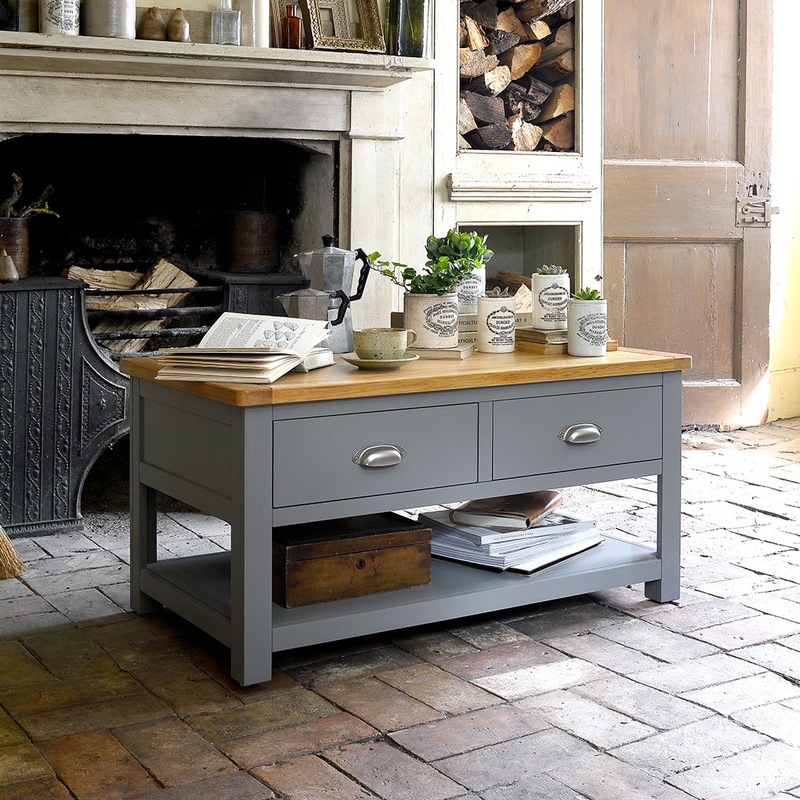 Don’t be afraid to mix the rough with the smooth in either a period property or a new property; much like this coffee table adds a fresh texture to older surroundings, worn, vintage furniture can add character and beauty to a modern property. Nothing communicates a chic modern interior quite as well as the sharp finish of a white piece of furniture. We love how our Extra Large Burford TV stand cuts right through the rustic interior of our Cotswold Co home with a beautifully pure white painted finish. 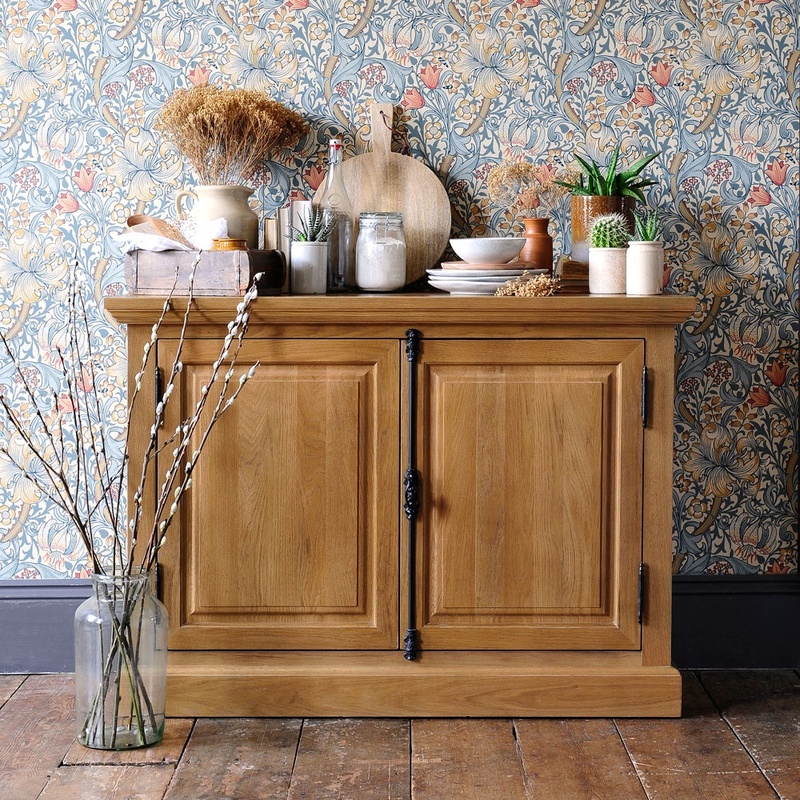 Combining a bold pattern like this William Morris Golden Lilly print with our rustic sideboard might seem like a traditional approach, but when you pull this look together, with contemporary crockery, cacti, succulents and bold floral displays, the look is suddenly bang up to date. Try adding hanging plants in simple, chic ceramics to your decor and find a classic country scheme can evolve into a refreshingly modern look. Metal and wood can work wonderfully together, and we think this vintage industrial style metal chair works beautifully with our Oakland Desk. This pairing captures a clever contrast between modern rustic furniture and the simplicity and function of industrial design. We also think the vibrant red enamel paintwork provides the perfect pop of colour that cuts through the traditional backdrop.